Slipping on a patch of ice, or a puddle of water that hasn’t been cleaned up, or tripping over a defective floor mat, and then falling are all common accidents. But what should you do if you’re the victim of a fall in which you are injured? The difference between duty – or what is owed someone who falls – is different depending upon the reason that the person is in your home or business. Under Alabama law, the least duty owed is trespassers. It also matters if you have a person to your home who is just visiting. But the highest duty is a business invitee, someone on your property for your own economic benefit. For instance, if you have a Tupperware party at your house, and someone were to get hurt, that is the person you owe the highest duty to because they were there for your economic benefit. So, in Alabama, it does matter why a guest is in your home. In premises cases, the evidence is really important, and it is important to gather that evidence quickly. Take pictures of the puddle, or buckled floor that caused your fall. And nowadays, most businesses have video cameras. Get a copy of the store video, if possible. 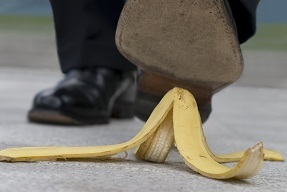 Be proactive in gathering any evidence that may show how and why you fell and injured yourself. Many businesses will quickly remedy and repair the hazard right after someone falls, so your window of opportunity to gather the evidence is small. There are two types of insurance coverage that can apply to these types of accidents, and the first is liability. In these cases, you must show that the business was at fault, that they knew or should have known about it and didn’t remedy it, and that you were injured as a result. The other type of insurance is no fault, in which case it doesn’t matter who is at fault. This is a medical payments policy, and you will be paid a certain amount for your medical expenses. A good idea, if you aren’t sure, is to consult an attorney who handles these types of cases.